Check out the Vortex in Little Five Points. They're famous for their burgers and their attitude. Check out this quote from the Vortex rules you'll find in the menu: "CELL Phone Etiquette - Cell phones are a part of modern life, so we can't really ban them. And you are free to be as rude to your friends and dining companions as you'd like, but if you expect our staff to serve you, then you need to get off the &*$% cell phone. Vortex employees won't talk to anyone using a cell phone at our host stand, tables or at the bar. Seriously, we will totally ignore you. In fact, using a cell phone while trying to place an order may result in bodily injury or death." Don't worry. The burgers are worth it! Go for the coronary bypass. A big half-point sirloin patty topped with fried egg, three slices of American cheese, and four slices of bacon. Plenty of mayo too. Better be ready to take a walk in Freedom park down the street to work it off! Really, though, any of the burgers are great. Have it with a Sweetwater 420. ($ - $15 per person). 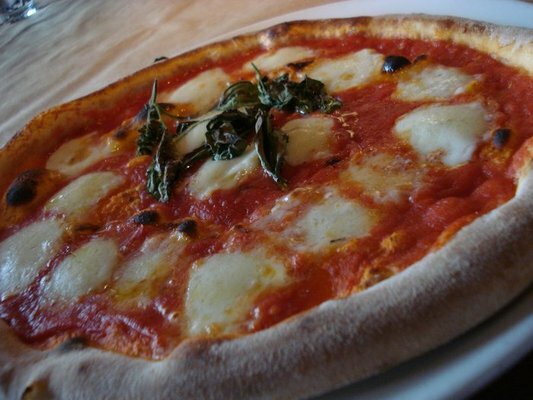 Authentic Italian pizza. It's a great idea. Try out Fritti in Inman Park. They have great Pizza, and a great patio to enjoy it. Order a bottle of sangiovese, and order the quattro formaggi. Four cheeses that'll treat you right. Should be about $20 per person.